A review in 10 words (or thereabouts): The lifestyles of the rich and privilaged, and boy are they messed up. Cadence Sinclair loves spending time on her family's island Yes. They have an island. They're kind of like the Kennedy's...or what I imagine the Kennedy's to be like. For all the money and material possessions, there is a truth they never let anyone see. They're not happy. But on the island, with her cousins, Cady forgets all about the trust funds and the family promises. Until one fateful summer. A summer Cady has forgotten, but a summer she desperately wants to uncover. There is a cool airs of mystery going on in this book. Lockhart gives you just enough to keep you guessing, but not enough to spoil the fun. She interweaves a unique storytelling in Cady's voice that brings depth to her emotions and frustrations and adds to the false fairytale of life of a socialite. Picturing Cady's world and sympathizing is a little difficult. Her "reality" is so far from anything I know that I definitely had moments of wanting to tell the poor little rich girl to get over herself. And I spent some time wondering how realistic the story really was for the rich and fortunate. I would have enjoyed see parts of the story from someone else's perspective...maybe the patriarch or a greedy daughter. An all-around excellent read! I started out with the audiobook but switched to print half way through because I just wasn't in the car enough, and I absolutely had to find out what was going on. The characters were interesting and the story was a thriller without being an adventure which was a breath of fresh air. Read this book! 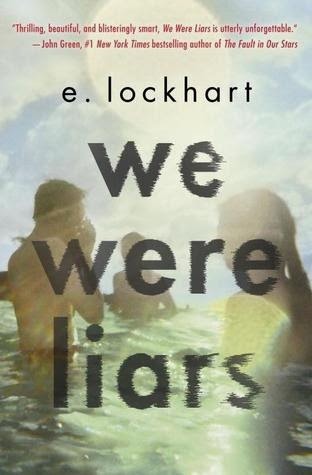 Read all of E. Lockhart's books. They're kind of awesome.